I have taken the Mineral Hygienics Challenge and I AM AMAZED by the results !!!! Are you ready to be Amazed ??? Recognized worldwide for having the best mineral cosmetics. They have a LARGE variety of foundation types for different skin tones and have large number of shades to choose from . Mineral Hygienics will work for you we are offering a 45-day Money-Back Guarantee. If you're not delighted with the results, simply return the product within 45-days. After reading so many reviews about Mineral Hygienics i was so excited to give them a try . And i must say , I AM MRE THEN SATISFIED ! 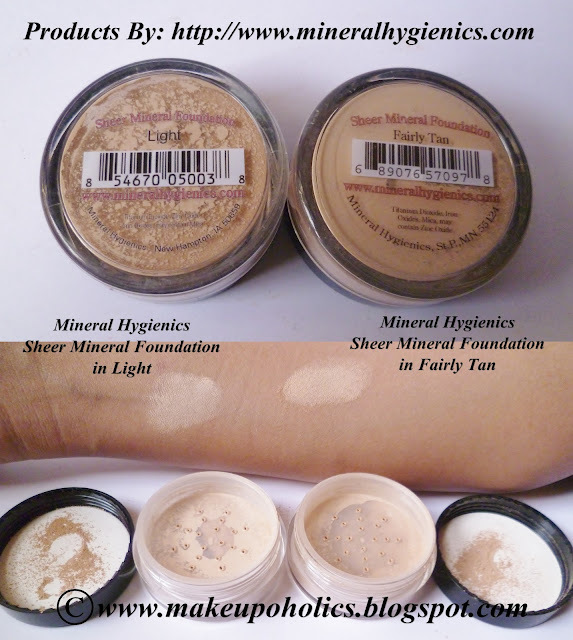 The shades that matches my skin tone perfectly are Mineral Hygienics sheer mineral foundation in Light and Mineral Hygienics sheer mineral foundation in Medium. I got the quite good amount of all the products in a beautiful jars specially designed for loose mineral products having sealed small holes in the protecting shield. ( i hope i am saying it right ) But I love this feature. After opening the cap you don’t get straight to the product .You need to open the holes in the protecting plastic shield with a pin to get access to the product. which makes it very easy to use and saves you from wasting any product which is truly a huge advantage. You need to apply some light amount of moisturizer under Mineral Hygienics Loose mineral foundation especially during winter season. My skin is oily , but still i needed a light amount of moisturizer to prevent it from looking cakey and dry( as the weather is changing to little hotter in my home town). I would definitely recommend a dewy makeup primer beneath this foundation to get that flawless look e.g Adorn skin primer ( read my review Here ) . But i must say , after using a Mineral Hygienics mineral foundation i can clearly see the difference. It will give you that natural flawless glow and even skin tone without making you feel any thing at all on your skin. This feels so light on my skin and i simply loved it for that. The pigmentation is very good as well. Believe me you need a very small amount for the compl,ete coverage. Just build it up slowly so that you don’t end up looking cakey . Another thing is that , blending is the key not only for this but for all foundations. But you need to move your Mineral Hygienics Kabuki brush in round circular motions to get the flawless finish. I mix both shades (Mineral Hygienics sheer mineral foundation in Light and Mineral Hygienics sheer mineral foundation in Medium), to get that perfect looking flawless skin. And it worked for me very well . I am getting lots of compliments when i am having it on my face. And the best part is , it didnt break me out at all. Better Coverage : Totally agree . It gives you better coverage without leaving you feel cakey. Even skin tone : I successfully achieved that. And I totally agree to the remaining claims that it gives you that healthier look and it perfectly suites my sensitive skin. Mineral Hygienics offers truly amazing products. All their claim are 101% true that’s why they are offering that money back guarantee. 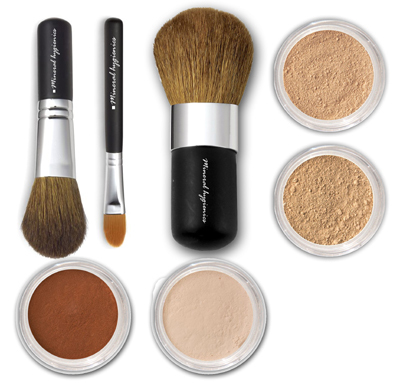 Highly pigmented and easy to blend , i love this transparent loose powder for the sheer perfection. It has a matte finish but still manages to gives you that radiant look.You just need to apply a very small amount of it and blend it well to avoid that cakey look. Great pigmentation and quite easy to blend , i love the color. 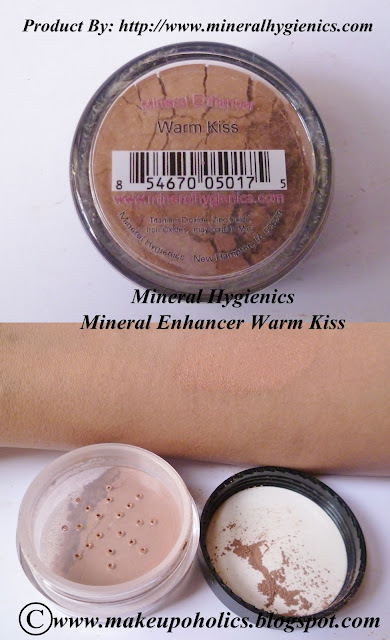 As you can see from the above swatch , Mineral Hygienics Mineral Enhancer Warm Kiss has some peachy pinky browny tone ( I am really confused) and have some light sparkles or shimmers . But when you apply it on your face it gives you that warm fresh radiant look instantly. To tell you the truth , this was my very first experience with a Kabuki Brush.Befire it , I was applying my mineral foundations with Sigma F80. But I must say that a right brush for a particular product can trully make a difference. Mineral Hygienics Full Coverage Kabuki Brush is trully amazing . This cute little brush is very soft and dense. Just follow the instructions given with it about its usage and see the magic. It will trully help you to get that flawless finish. I really appreciate the concept of providing this perfect brush with such great products with a detailed description guide towards its usage , to get the maximum results . The starter kit also includes the following detailed how-to guide to achieve that flawless look. For more details you can check Mineral Hygienics Mineral Cosmetics WEBSITE. 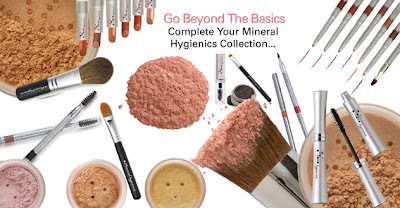 Natural Mineral Makeup By Mineral Hygienics are generous enough that they are giving 10% off coupon to my lovely readers which they can use on their Mineral Hygienics order. so don't waste any further moment and place your order Now . I have come up with the following TWO looks using Mineral Hygienics Medium Starter Kit. 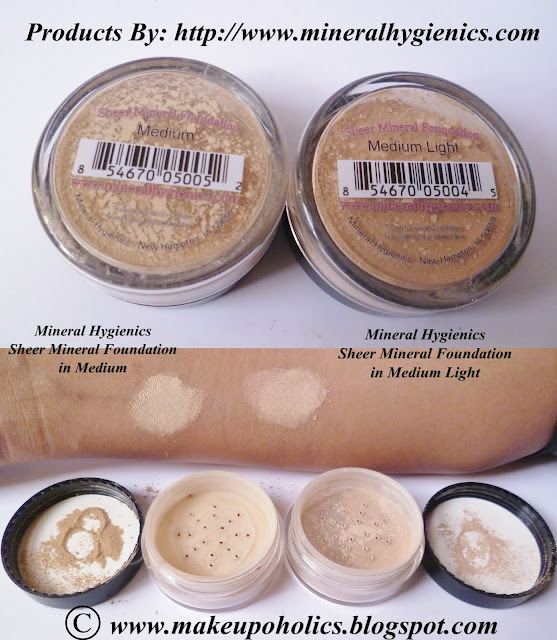 Mineral Hygienics Mineral Hygienics sheer mineral foundation in Light and Mineral Hygienics sheer mineral foundation in Medium. Mineral Hygienics Sheer Perfection Silk Translucent. Ecco Bella Flower Color lipstick in Peach Rose #12( review HERE ). 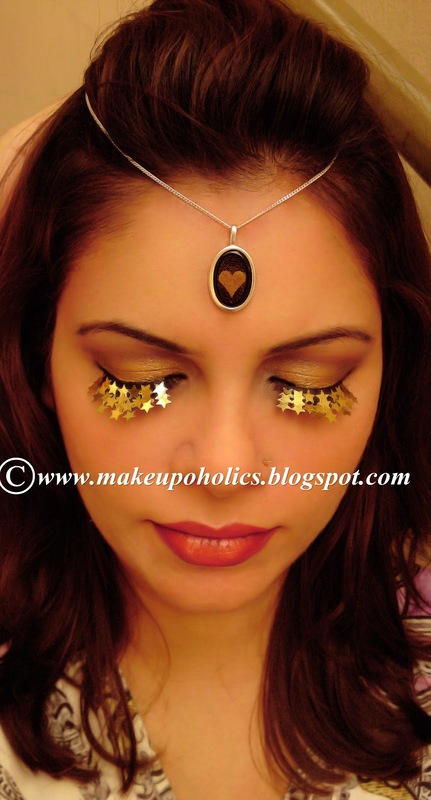 Shimmer Twins Small Gold Stars Lashes ( review HERE ) . Soo pretty! I love both of your looks!